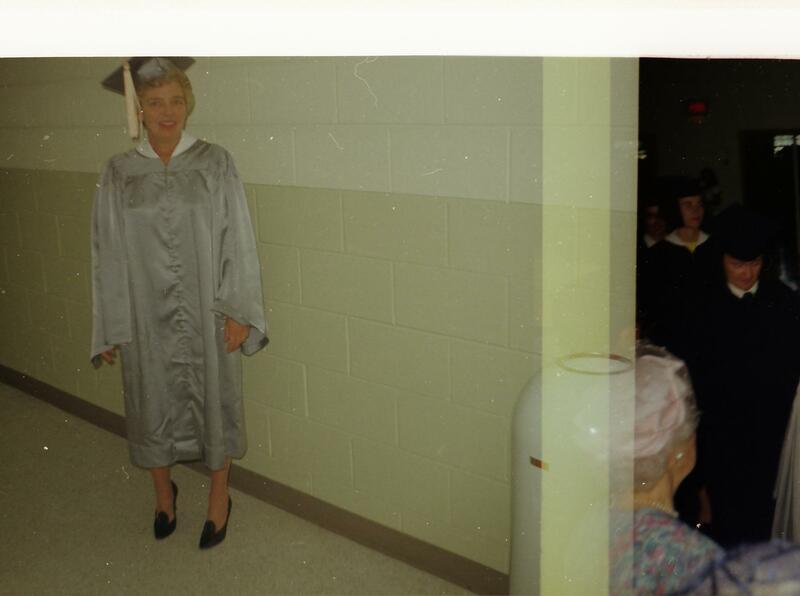 Here are a few pictures of my Grandma Wooten from around 1970. I knew she was a nurse at some point but hadn’t known she had gone back to school for it when older. I don’t know when she was born exactly, but she’s clearly not 22 here. She always seemed much older to me than she probably was. This is a few years before I was born, and she aged a lot between these photos and when I was accustomed to visiting her. I remember once crying as a very little boy when we drove to Wrightsville Beach to visit her because I thought she was mean and I didn’t want to visit. She was extraordinarily wrinkled and was cranky and sat in the same spot on the couch in the dimly lit house she rented, smoking nonstop and drinking tea from a brandy snifter and watching NASCAR and Cubs baseball and National Geographic. She and my parents would always argue for about half the time we visited, and though as I grew up, I learned that arguing about a topic doesn’t always mean you’re actually fussing with each other, I think it sometimes got a little mean spirited, which didn’t help my impression that she was an old grouch. The only toys at her house were a motley set of rusted miniature (bicycle?) license plates from various states. I would pull these out and balance them against one another to make little buildings. Sometimes my sister and I would walk a couple of hundred yards down the street to Johnny Mercer’s pier for a few minutes, or to the hotel between the pier and her house (which she rented the downstairs of from a man she seemed to hate named Walker Brown) to buy a soft drink from one of the vending machines in the parking garage. Otherwise, we mostly sat around watching whatever Grandma had playing in the background on the television. She had a way of holding a cigarette in a hand near her face and rubbing her lower lip absently with the ring finger of the hand. Her hair by the time I came along was pretty much completely white and curly and looked very soft, like wool. One room of her home that we didn’t go into very often had a collection of minerals in a wall-mounted rack with dozens of little compartments. She had several large geodes, and some sculptures of sharks or dolphins made of I don’t recall what — perhaps porcelain. She had various other curios that were neat to look at. I think she was fairly interested in science and the natural world. I think that if I had known her when I was older, I might have found that she was a pretty fascinating person. When I was in probably middle school, she moved out of Walker Brown’s place into a condo that my uncle owned. There was a mall nearby that I would sometimes walk to to browse a book store. The visits remained pretty much the same, with Cubs or National Geographic or racing on television and with the arguments maybe becoming more vitriolic. I remember that one Thanksgiving my mom packed up some food to take her a Thanksgiving meal. She lived about an hour away, so it was a little bit of trouble. Grandma for some reason or another was kind of a jerk about it, and I think Mom packed up the food and drove home crying over it. I don’t know how much having had a hard life excuses being mean to people, but it’s my understanding that Grandma had a rough life. Her husband was I take it another pretty fascinating person, but he wasn’t nice to her (what that means exactly I’m fuzzy on), and she had three kids and was essentially a single parent in the 50s and 60s. 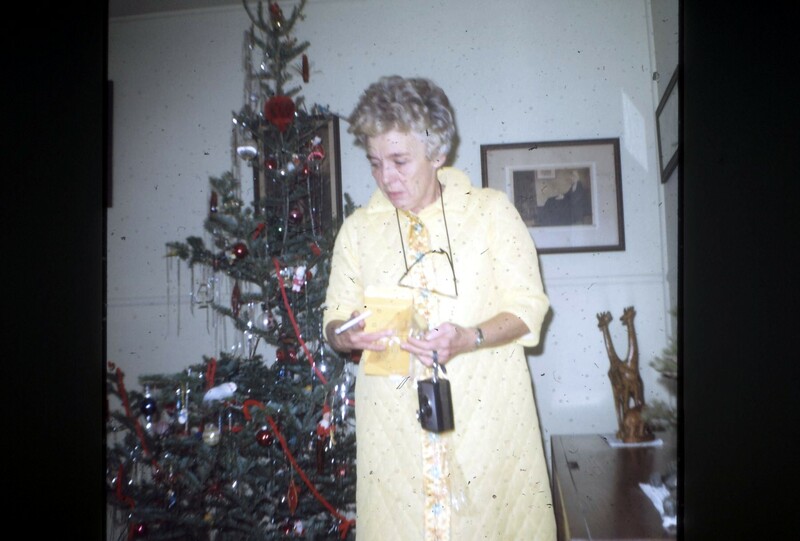 Drinking wasn’t something I ever saw her doing, and I never saw my parents drink any alcohol (a vendor once sent my dad a few bottles of wine that went unopened for years), but I remember once looking in the pantry at her condo and seeing a bottle of Jim Beam back there. I must have been a teenager at the time, and I remember being surprised and in a way sort of pleased. She had cancer when I was in high school, and she wound up dying alone and in a grotesque way and was found by my other uncle, who had been living with her at the time but been away from the condo at the time of her death. Since I had always found her pretty uninviting and uninterested in me and basically mean, I wasn’t too bothered by it, but I have thought a few times since that I might have liked to know her before she grew bitter, or to have better understood and known her when I was older, as I really do think she was probably a smart and interesting person I just never had a chance to get to know properly. I don’t remember what made me think of it, but yesterday I had a sudden vivid memory of the wife of one of the preachers in the church I grew up going to. The family was composed of father, mother, a daughter a year or two younger than me, and a son several years younger than me. I forget exactly how old I was, but I’m thinking I was maybe seven or eight and the little boy was three or four when the family first moved to our town. He was really into pretend karate fighting, and I would let him punch and kick me, so he liked me a lot. The mom was soft spoken and a little withdrawn, though she had a kind air about her. She also seemed sort of fragile, a bit mousey. I don’t remember whether it started right after they moved to town or whether it began a year or two into their residence (in the Methodist church, preachers rotated every few years on some random-seeming schedule that I never understood), but at some point, she began crying in church pretty regularly, and though I remember thinking it was kind of weird, I didn’t think too much about it beyond simply observing it. Sometimes she’d merely project a sort of weepiness with a trembling chin and puffy eyes, and sometimes I think she would actually cry in church. It never struck me that she was crying with religious fervor, but more that she was crying in an unprompted way, a way that wasn’t really normal for grown-ups, or at least for grown-ups I had been in the habit of being around. Once I was invited over to a sleepover at the parsonage. 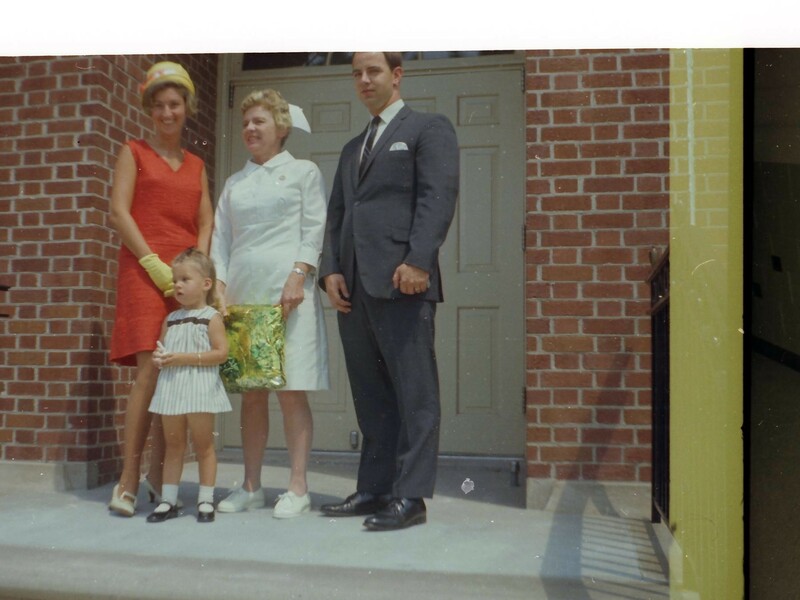 I suppose this must have been a couple of years into their residence, so that the age gap between the little boy and me was a hair less significant. I vaguely remember feeling weird about the sleepover. Although I must have enjoyed the punching and kicking and other play to some degree, I think I may have felt a little bit like a sacrificial lamb, as if I was being sent over to divert the other kid and less because I was eager to play for my own benefit. Given a choice between a sleepover with this kid or a sleepover with a peer in my own age group, I surely would have chosen the latter. I have a few visual memories of the parsonage. I remember watching a little TV or perhaps playing a few minutes of a video game. I’m sure we play fought a little bit. And then I remember the mom crying, and I remember my feeling that things definitely were not ok, and that I didn’t know what to do and didn’t want to be there anymore. I forget whether she asked me to call my parents to come get me or whether I wanted to call home. I think I did wind up going home that night. Only as a grownup with the weird flash of memory about this family — a family I haven’t thought about one bit in probably close to 30 years — does it occur to me that this woman was depressed. She wasn’t a weirdo or a delicate flower or anything; she was depressed, overwhelmed, and having real trouble coping. I remember as a kid thinking that it was strange that the preacher’s wife often seemed so upset. If anybody should be happy, it should be the family of a preacher, as close to God as those people must be by virtue of their relationship to the preacher, who after all was super close to God and thus somehow immune to whatever grownup problems there were in the world. I am not a religious person, and thinking about it now, I wonder if depression isn’t somehow almost worse for people who are religious. If I feel sad or deflated or overwhelmed or blah, there is no greater significance to the feeling for me; I just feel that way and there’s no sense for me that it’s in spite of faith or is some kind of test of faith or is the will of a power I’m supposed to revere. But to be the preacher’s wife and to be depressed must feel like some kind of horrible betrayal, or must feel more keenly like a personal failing (as if having greater faith might have prevented the terrible feeling), which seems like it would exascerbate the depression. Really I think it’s not valid to talk about one depression being worse than another — it’s a very personal thing, tailored to the individual — but it’s sort of tempting in a case like this. If I feel bad, I can chalk it up to bad chemistry, which in a way seems less like a kick in the teeth than feeling like a personal moral failing might also be at play. Last night I grilled hot dogs (I know, yuck) for dinner, and today I microwaved a leftover one for lunch. In fact, I microwaved it twice because while I was fixing my lunch, I got a call that I needed to go pick my son up from school. So I got out all the lunch stuff, microwaved the hot dog, got the call, put all the things back in the fridge, picked up my son, got all the things back out of the fridge, re-microwaved my hot dog, and brought my cylindrical mush of pig anuses back to my desk to stuff down my gullet while trying to dig myself back out of the hole that the interruption to my work day had helped make deeper. Or to put it another way, I savored my thrice-cooked tube steak while admiring what few and trivial things the well-oiled machinery of my personal work habits required that I pick up upon my return. As the hot dog sizzled in the microwave, I had a sudden memory of the first microwave my family ever got. It was a huge Amana brand countertop microwave with a door that swung downward like that of an oven. Some guy delivered it on what I recall as a Saturday. Only my dad and I were home, and we plugged it in and cooked a couple of hot dogs right away, marveling at and perhaps falling just short of high fiving over how they swelled as they cooked. It was like some sort of sorcery. Food, cooked in instants — and entertainment too! It’s possible that we cooked more hot dogs than we actually required, so that we could watch the demonstration again. And that is the memory. 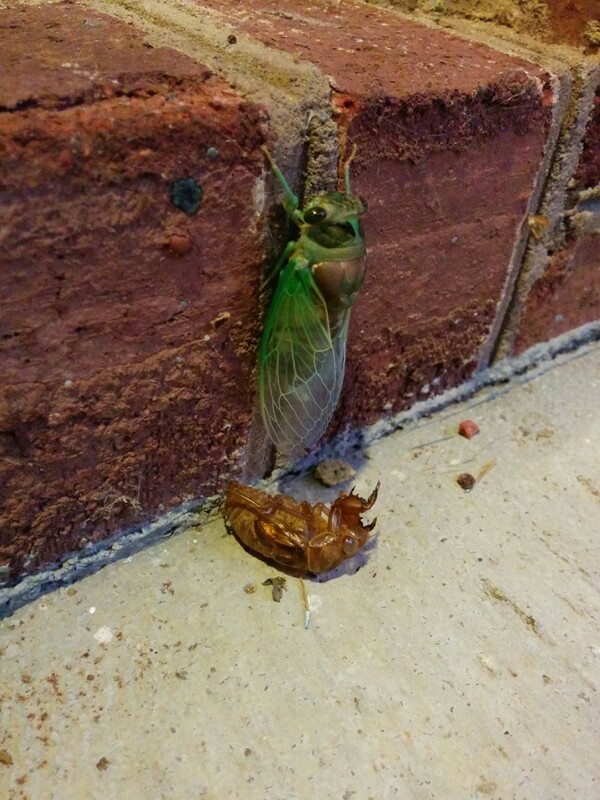 While walking the kids to the bus stop this morning, I found this cicada clinging to our house. I’ve never found one freshly molted before. It’s been a while since I remember finding a live one, in fact. This took me back to my childhood, when I would find them quite frequently in my neighborhood, often on our driveway, where they would get turned over onto their backs and buzz their wings rapidly to try to flip back over. It’s a very distinctive sound that I hadn’t thought of in many years but that I still have a vivid sensory memory of. This guy’s still pretty green. I suppose that’s because he’s freshly molted; I remember them as being much darker. I spent some time today thinking and writing about the recently announced movie, entitled The End of the Tour, that will dramatize the events of David Lipsky’s book Although of Course You End Up Becoming Yourself. The book is an edited transcript of a road trip Lipsky took with David Foster Wallace on the Infinite Jest book tour. I’ve written extensively about Wallace elsewhere and occasionally here. One of the things I’ve struggled to remember when writing about Wallace was when exactly I first got my hands on Infinite Jest. Of course I knew it was in college over some Christmas break, but I couldn’t remember the year. Fairly recently, I was able to recover some ancient email archives, and today I thought to check for any references to the book therein. I found one! I had such high reading ambitions for the break. I got through some Milton, a smidge of Eliot, most of a book on WCW, a few of Pound’s poems, and a fair amount of his prose. But I was hoping to get through PARADISE LOST at least two times, and I only managed one reading. Plus there’s a book on Stuart England that I wanted to finish besides reading most of Eliot’s poetry. What sidetracked me was a literary Christmas. My sis gave me three small books about language, two of them more glossaries than anything else, and a big fat fiction book. She remarked that it seemed like all I ever read was literary stuff and she wanted to make me slow down for some contemporary fiction. The book is about 1100 big pages long (100 of ’em end notes in about 6 point font) and is called INFINITE JEST, by David Foster Wallace. It’s been slow going, but worth it. I lack about 98 pages, and I’m pretty much in awe of the discipline required to put together such a complex work. Makes me feel inadequate for my struggles with coherent 18-line poems. So I’m glad to have been exposed to the book, but I hate that my academic reading’s been postponed. Jim was a fellow I met on a Usenet group dedicated to poetry, which I was pretty into at the time. So the reading references may seem pretentious but were at least earnest and relevant, as Jim and I were in the habit of swapping reading lists and discussing what we were reading. I really enjoyed being pen-pals with him and have often regretted that our correspondence petered out not too long after I graduated. He was old — apparently sort of a long-time staple in the Stanford poetry scene — and died sometime in the five years or so following my graduation. I write about this discovery in my email trove so that I can get back to it easily the next time I find myself wondering when exactly it was that I first picked up Infinite Jest. I first ran across attenuated in David Foster Wallace’s Infinite Jest many years ago and have never been able to remember what it means out of context. To attenuate is to make something thin, weak, or dispersed. Wallace uses the word to describe light and sound. The word comes from the Latin “tenuis” meaning “thin” and is related to “tenuous,” whose meaning I do remember easily and which link I hope will help to cement “attenuated” in my vocabulary. Although “tensile” comes to us from a different Latin root (though I gather the same Indo-European one), it’s another similar word I have a visual association with and consistent grasp of. Silly sample sentence: At ten, you waited, attenuated, for your breakfast, and then you ate it. I know lots of words. In fact, I used to joke with my daughter that I knew all the words, but then I read Blood Meridian and was made to feel stupid. I also happen to be kind of slovenly about looking up words. The Kindle, which briefly helped me look up words I might have glossed over in a print book for want of a nearby dictionary, turned into the thing I use to read the books I care less about than the ones I want to own in print. So I’m equally likely so skip the word lookup on the Kindle for these quick skims as I am to skip running upstairs for the dictionary when reading a real book I’m invested in. Several times lately I’ve run into words that I’ve seen a million times but couldn’t produce a useful definition for. More often than not, context clues are enough to get the gist, but even when I get the gist, I often turn right around and forget it. In hopes of helping to combat the memory loss, I thought I’d start a new occasional series (though I’m far too undisciplined for one of these Word(less) Wednesday type things that so many bloggers do) in which I highlight a word I’ve been lazy about. Silly sample sentence: When stupid Lou glued food to his new crude rood, he brooded, his mood lugubrious.